Similar to Java moss, the Java fern is another freshwater aquarium plant that is popular with shrimp. 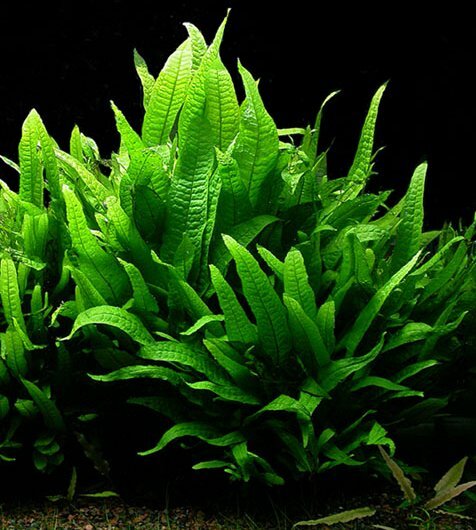 The Java Fern, scientifically known as Microsorum pteropus, is a very popular live aquarium plant from South East Asia that is available in many varieties. The most popular are the lance leaf, needle leaf, narrow leaf, or Windelov. 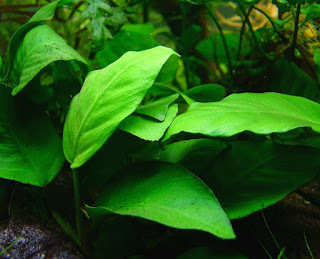 This plant is one of the easiest to grow in most tanks and will quickly spread like a weed if kept in good conditions. Of course, moving it around and/or replanting it will slow the growth process for a while, but in a few weeks it should be back in shape and reach over a foot tall and 6 inches wide. These freshwater aquarium plants are probably the most common plants for aquarists. Most cryptocorynes can be grown simply in potting soil. One of my blackwater mixes uses a 1:1 ratio of coarse river sand and potting mix. 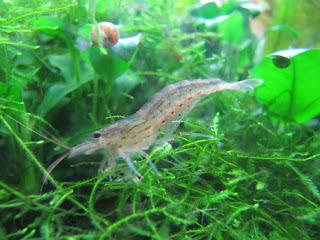 For some of the clearwater species I use a 2:1 sand/gravel and potting mix. I either make my own potting mix or buy Miracle Gro with the slow release fertilizer in it. If I make my own potting mix I add some slow release granules in a balanced 10-10-10 formula. 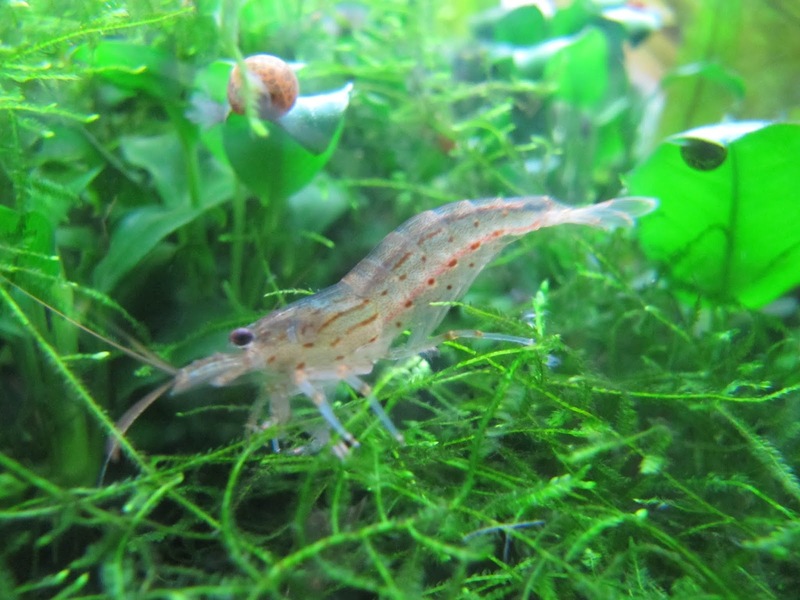 There are clear water streams and there are blackwater streams where cryptocorynes are found and I mix my substrate accordingly to better suit their growing requirements. Lilies and lily-like plants can grow quickly when provided optimal conditions. In general, these plants will benefit from the use of strong lighting and supplemental dissolved carbon dioxide. 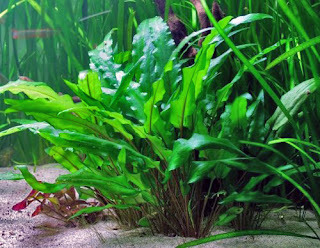 Aquarium lilies and lily-like plants will reward the hobbyist with noticeably larger leaves soon after these essential improvements have been made. Due to the heights it can reach, Vallisneria is mostly a background plant and can be placed at the back of to the sides of your aquarium. 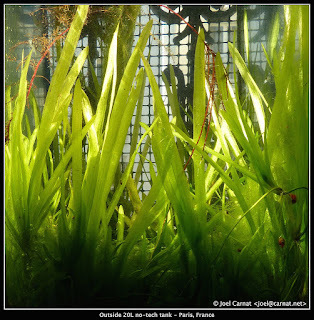 Planting is pretty straightforward: just stick your Vallisneria into the substrate and, if it already has extensive root systems, be sure to cover those as well without burying them completely. Extra iron is really appreciated by this plant and you may want to stick a few root tabs in the substrate nearby while planting. The Wisteria, also known as the Water Wisteria, is an undemanding, extremely attractive aquarium plant. The lace-like leaves vary in appearance under different conditions. 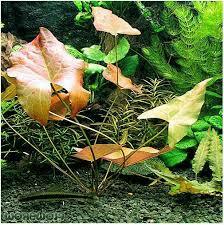 If the water is colder, they will be small, and lobed in appearance, instead of pinnate. If insufficient light is provided, they will only be slightly pinnate. 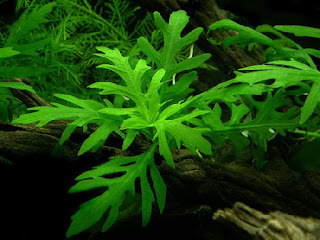 The Wisteria is an excellent plant for the new aquarist or for the newly set-up aquarium. It requires a nutrient-rich substrate, with iron-rich fertilizer added regularly. Provide a moderate amount of lighting of at least 2 to 3 watts per gallon of full spectrum (5000-7000K) light. CO2 fertilization is also recommended.